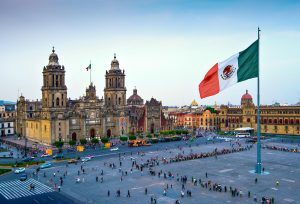 At 57,600 square meters, Mexico City’s main plaza, the Zócalo, is one of the largest open plazas of any city in the world. To provide a frame of reference for its size, imagine the area of ten American football fields, as for its significance, picture the National Mall in Washington D.C. or the Western Wall in Jerusalem. Long ago, this grand square once constituted the ceremonial hub of the Aztec city, Tenochtitlan. Previously dominated by looming silhouettes of Aztec temples and pyramids, such as the Templo Mayor, after several hundreds of years, the zócalo nowadays finds itself ringed by similarly significant and emblematic buildings such as the Metropolitan Cathedral, the Palacio Nacional, the Old Portal de Mercaderes and Federal District buildings. The term zócalo (meaning ‘base’ or ‘plinth’) as a description for a central plaza was only adopted into the common Mexican lexicon in the 19th century. 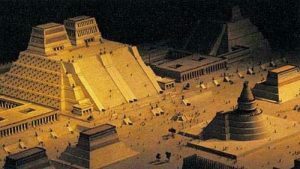 Supposedly, plans had been made to construct a large monument in the center of the plaza to commemorate Mexican independence from Spain, but nothing apart from the plinth was ever constructed. Hence the term Zócalo stuck, an almost ironic nod at the monument that never materialized. While the plinth itself disappeared with the passage of time, the name stuck and even spread to other large cities across Mexico, which began to use the term zócalo to refer to their principal squares. Fast forward to the 1990’s and the Zócalo was in a major state of disrepair. Mexico City was built on top of an ancient lake and thus buildings were sinking into the ground as the aquifers under the lake continued to drain. Additionally, occasional earthquakes didn’t help either. Thus, the Mexican government sponsored a $300,000,000 renovation project to restore several of the buildings in the center of its nation’s capital to their former glory, especially the Metropolitan Cathedral. Throughout its nine – year restoration, a mammoth green scaffold buttressed the interior of the Cathedral, being readjusted every fifteen days along with the Cathedral’s warped foundation. The goal of this project was not to entirely stop the building from sinking, but rather, to ensure that it sank uniformly and did not collapse on itself. This was no easy task, but was engineers successfully completed the renovation in 1998. 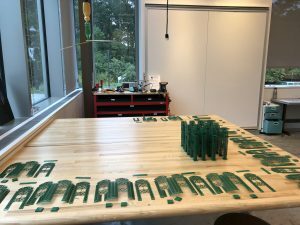 Around the same time, 23-year-old Pedro Lasch, currently a Duke professor, artist, and director of the Social Practice Lab at the Franklin Humanities Institute, was well on his way to finishing his B.F.A. at the Cooper Union in New York City when he returned to his native Mexico City. Lasch was authoring his first book, a history of all of the monuments that had been proposed to occupy the main Mexican plaza but had failed to ever be constructed. From the time of the first failed shrine to Mexican independence from whose “plinth” the zócalo received its name, to the dawn of the 21st century, there had been numerous attempts to place at the center of the Mexican capital some piece of public art, all, sadly, in vain. Figuring that a book on failed proposals for monuments in the zócalo would be incomplete without his own, Lasch submitted to Mexico City’s Commission of Art for Public Spaces (CAEP), which was seeking proposals for something iconic to celebrate the renovation of the main square, a motion that he reassemble the 300 – ton scaffold as a temporary exhibition on the Zocalo, exactly as it had existed in the Cathedral. Lasch knew that this proposal would surely fail, but at least this crazy and ambitious idea would be a good addition to his book. “I wanted this book to be in dialogue with what I knew would be a failure,” said Lasch. However, only a short while later, Lasch received a call back saying that his proposal had been accepted. Can you imagine? Here he was, early 20’s, just out of art school, and his proposal for a national monument at the very center of his country, which he had proposed anticipating sure failure, had been enthusiastically approved by the governmental authority? This would change his career, nay, this would change his life! However, it ultimately was not to be: even Pedro Lasch could not escape the curse of the zócalo. One year and numerous negotiations later, the project was abandoned due to conflicts between left and right governments of the city and the nation, respectively. Instead, a giant flag pole was put in the center of the city as a part of the flag degree in 1999. Lasch was destroyed. “It was quite traumatizing actually,” he remarked. Several years later, in 2004, Lasch produced an installation and video that follows the evolution of his almost-triumph and reuses the original photographs and simulations that he proposed to the city council. Held in a French private collection, this work has since been exhibited in New York, Marseille, and Mexico City. The pathos of the installation was quite simple, to showcase the actual narrative of his proposal as a form of social practice art, using the narrative of his initial proposal, its acceptance, and later rejection to juxtapose the vision of an ambitious concept with the nonfulfillment of its materialization. While Lasch moved on with his career, going on to become a celebrated professor and artist, his past came back when a year and a half ago, he was invited by curator Alberto de los Ríos to represent the project in a solo show at Mexico City’s highly respected non – commercial gallery, Casa Wabi. 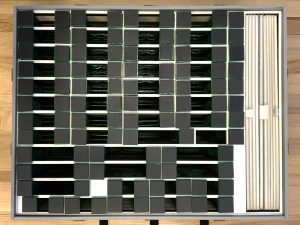 In addition to the previous elements of the installation, he added a new large – scale architectural model (9 x 12 x 3’). Inspired in scale and style by architectural models from the downtown Zócalo subway (Metro) station that show different periods of Mexico City since Aztec times, this element of the project was produced by the artist, Luis Rosey, Natalia de la Rosa, and the very team of Arquitectura Plástica Sensorial that recently restored the metro station displays. 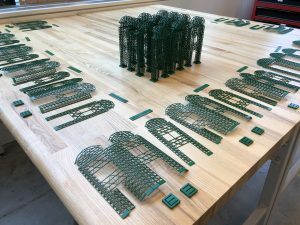 The model includes the area and buildings of the National Palace, the Cathedral and Sanctuary, the Zocalo, and the 300 – ton green scaffold. In addition to the model, the installation features the letter signed by Mexico City officials in 1999 accepting Lasch’s proposal, as well as the original proposal documentation. 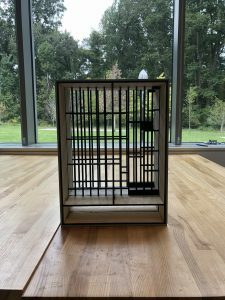 The scale scaffold was entirely produced by Lasch in an intensive six – week period of prototyping, digital file processing, laser-cutting, painting, glueing and assembling at Duke University’s Innovation CoLab maker space in the new Rubenstein Arts Center. 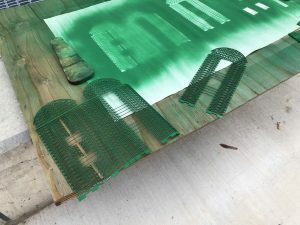 Lasch would spend eight hours a day, five days a week in the Ruby perfecting his design, experimenting with material settings, spray painting the miniature scaffolds, precisely gluing them together, and rapidly iterating to correct any flaws.. 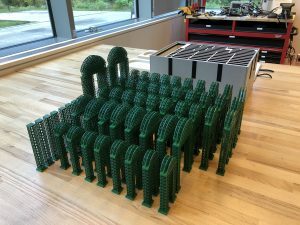 Moreover, the process included the creation of a unique box to hold all 52 fragile scaffold pieces, designed to fit in carry-on luggage so it could be transported easily abroad without damage. The exhibition in Mexico is open to the public every day 10am-5pm until January 27th, 2019. It opened on October 24th, 2018 with great success and national press coverage the following day. Recently, Lasch co-taught an online course on Coursera called “Art of the MOOC: Public Art and Pedagogy” which, to date, has had 30,000 students from 134 countries. In the spirit of the zócalo proposal, he encourages students to get outside of their comfort zones, take risks, and create their own public art interventions. This entry was posted on Friday, November 30th, 2018 at 9:39 am	and is filed under News, Uncategorized. You can follow any responses to this entry through the RSS 2.0 feed. Both comments and pings are currently closed.